Foodies need look no further than Humboldt County. Fresh seafood, humanely and sustainably raised meats and lush, organic produce are the staples of the region's eateries. Local chefs offer innovative and artistic plates, as well as traditional favorites. Wash it all down with a locally crafted beverage, as Humboldt is home to a number of distilleries, breweries, cideries and vineyards. 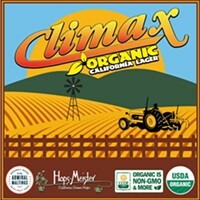 Climax Organic California Lager release! @ Eel River Brewing Co.